CLiPtec BGE680 In-Ear Gaming Earphone with double microphone is a newly high performance and multi-platform compatible in-ear gaming earphone with double microphone. The gaming earphone with double microphone. The gaming earphones widely-use and compatible with multi-platform compatible with PC, notebook and Mobile / Tablet devices. In the package there is also a PC extension cable and audio convertor. Design with a dual microphone, pluggable adjustable rod microphone and Line-Control Microphone, its let your communication more clear with other gamer and also can change into music earphone. CLiPtec BGE680 is a lightweight earphone design with different size of soft silicone ear sleeve, which is more comfortable for long time wear, and it is a great earphone for game player, allowing you totally immense into your games without wearing the hot and heavy gaming headset. Design with a dual microphone, pluggable adjustable rod microphone and Line-Control Microphjone, its let your communication more clear with other gamer and also can change into music earphone. Light-weight earphone design with different size of soft silicone ear sleeve, which is more comfortable for long time wear, and it is a great earphones for game player, allowing you totally immense into your games without wearing the hot and heavy gaming headset. The gaming earphones widely-use and compatible with multi-platform compatible with PC, notebook and Mobile / Tablet devices. In the package there is also a PC extension cable and audio convertor. 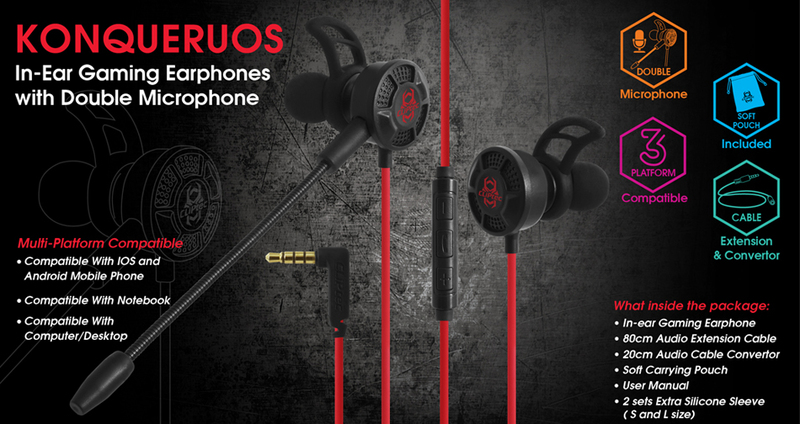 Built-in with 10mm neodymium drivers, deliver unbeatable in-ear audio with nature high-reliability, crisp trebles and powerful bass - allowing you to hear and retain your daily soundtracks perfect and experience the true gaming atmosphere. 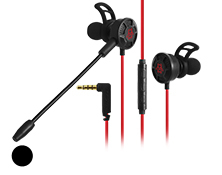 The earphones microphone Includes volume keys, microphone switch button, answer button. User-friendly design to facilitate game player operation. Built-in high-definition microphone, when unplug the main microphone, the headset's hidden microphone will immediately start working to continue pickup your voice.